The Customer List shows you key statistics on your attendees and all their latest responses from your booking forms. All of this information can be searched, filtered and ordered to give you customised lists and reports. Attendance date. Search for customers based on when they attended an event. Booking date. 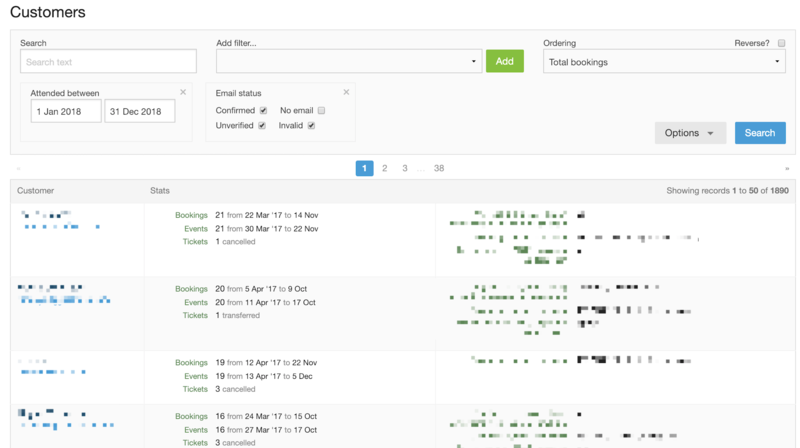 Search for customers based on when they booked an event. Email status. Gives you options to search by whether an email exists for a customer, and whether it's valid. Child status. Useful for filtering between adult and child attendees. If you have child attendees, make sure you're set up for that properly here. Any field included in your booking forms. This could include fields such as consent to marketing, age, dietary requirements or anything else you might have asked in your booking forms. You can add multiple filters to your search. Just click the drop down menu (screenshot below), select your filter and then click the green add button. In the example below Attendance date and Email status are being used. To order, just click the 'Ordering' drop down menu, select your choice and then click search to reorder your results. You can also order in reverse by ticking the 'Reverse' box. Once you've completed a search you can export the corresponding information in a .csv file, or extract the email addresses. Just click on options. Your .csv export will include all of the associated stats featured on the customer list, class pass information and all booking form responses. Yes/no questions (such as consent to marketing, or T&C's) will be represented either as blank (no response), 1 (Yes) or 0 (No). These .csv exports can easily be imported to Excel, Google Docs or any other spreadsheet app. Click here to learn how to import your .csv list to Mailchimp.